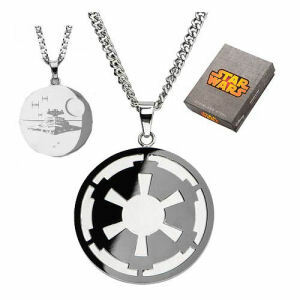 We have Just Sold out of Star Wars Imperial Symbol and Death Star Etched Pendant Necklace. This Item is unavailable at present. From the Star Wars collection by Body Vibe. Star Wars Imperial Symbol and Death Star Etched Pendant Necklace. Pendant features the imperial symbol on one side and an image of the Death Star with a Star Destroyer on the other. Pendant has a diameter of 1.5 inches.